Police near Khao San Road have admitted that the law regarding the use of Grab Bike and similar services is still unclear. They have called on motorcycle taxis (win), Grab, taxi drivers and Uber to keep calm and call the cops if there are disputes. In a latest case that happened in Chakraphon Road a Grab rider was attacked by a "win" rider. 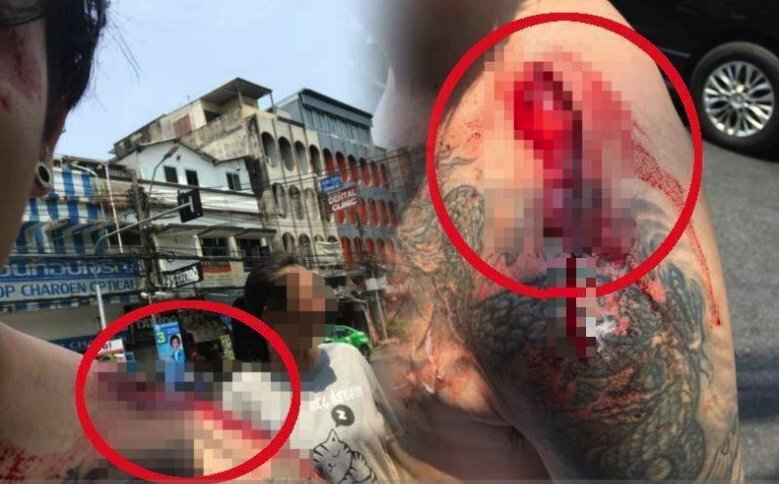 Pictures of his bloodied shoulder caused a lot of comment from the public after they appeared on the "Patiharn Sarikapun" page. Pol Lt-Col Phuwadon Unphote of the Chanasongkhram police near the end of Khao San Road told Daily News Online that this was a case of turf wars between Grab and regular motorcycle taxis. A verbal argument had broken out that led to violence. A man is to appear in court charged with assault after the incident on Tuesday. Lt-Col Phuwadon called for calm while admitting that the law is unclear at this time regarding the use of services like Grab and Uber. He urged people to call the cops if there was trouble. The injured poster on Facebook said they would continue working for Grab and were OK but undaunted. What is unclear? That assault is against the law? Or that competition is not welcome? Would you please explain the law as you know it. I only figure if Grab is operating in a city it must be with legal permission. Vietnam also there is no problem at all with Grab, of coarse Thailand has a problem. on sukhumvit soi 11 the local win at the end of the soi are a godsend. mouth of the soi, not so much. You are so right. Here, you are likely to get more jail time for saying the wrong things about certain people, than you do for man-slaughter, or fleeing the scene of an accident with fatalities. And have the general public have a choice? It will never happen as we both know... sadly.